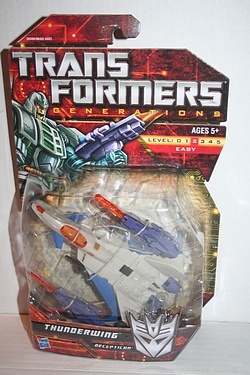 Let's finish up Transformers: Generations wave 5, aka wave 1 for 2011 (early!) with Thunderwing, a serious bad-news bot! Even Megatron is given pause by the power and fury of this Decepticon, though is likely thankful that they are on the same side, and that Thunderwing is so devoted to the cause. He's good at following orders, and Megatron certainly has enough of those to give! Click the image above to learn a little more about this planet-wrecker, who has emerged from the Mega Pretender depths of the '80s to his new Deluxe tribute form.